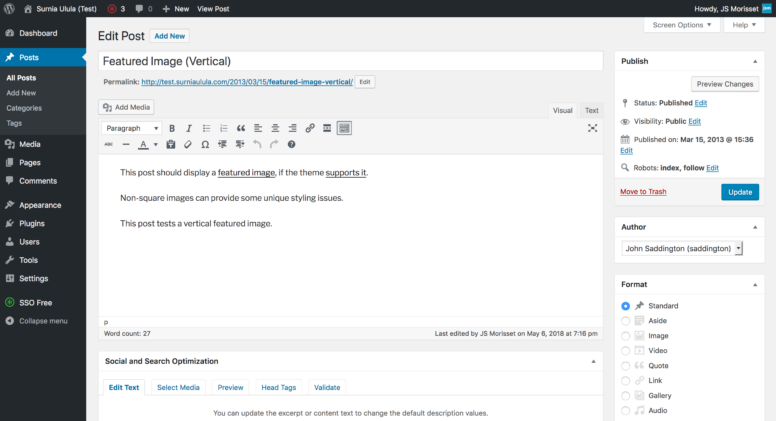 The classic WordPress post editor showing WPSSO status and error notifications. 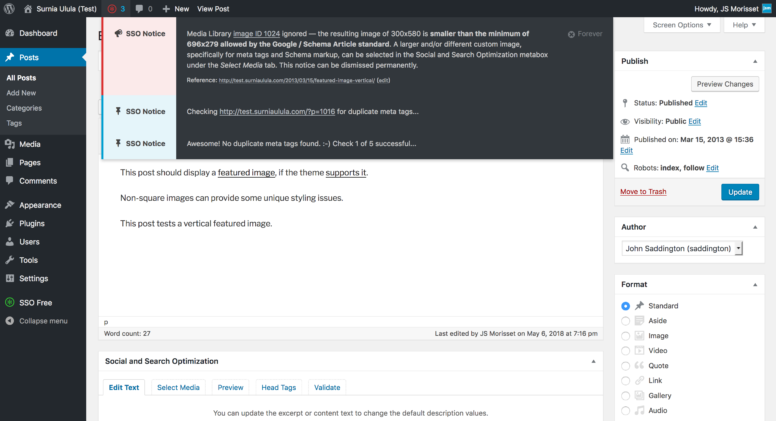 Notifications in the Gutenberg editor are displayed over the content area, forcing users to dismiss notifications. Non-dismissible notices simply block the content area. 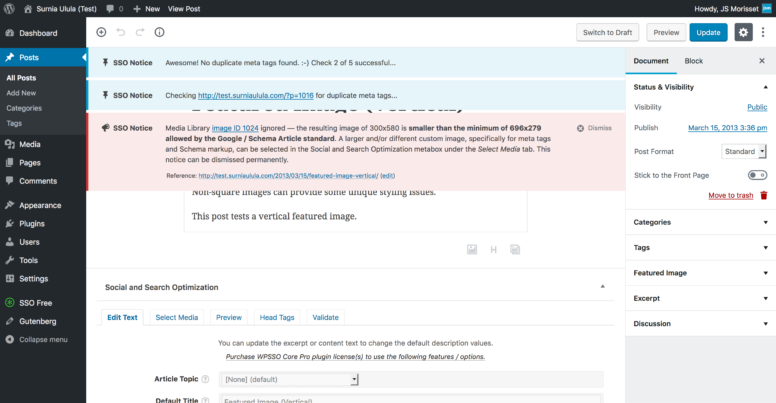 To provide its users and customers with a better notification experience, the next release of WPSSO Core will move SSO error, warning, and information notices into the admin toolbar. The toolbar menu item will be a simple SSO icon and counter, which changes color based on the most important type of notice it contains (red for error, yellow for warning, blue for informational, and grey for 0 notices). WPSSO Core v4.2.0 showing 3 notifications in the admin toolbar. The SSO notifications in the admin toolbar can be displayed at the users convenience. Some notices may also be dismissed for a period of time (1 hour, 1 week, forever, etc.). WPSSO Core creates complete and accurate meta tags and Schema markup for Facebook / Open Graph, Google Rich Cards / Knowledge Graph (SEO), Pinterest Rich Pins, Twitter Cards, Weibo, and more — all from your existing content. 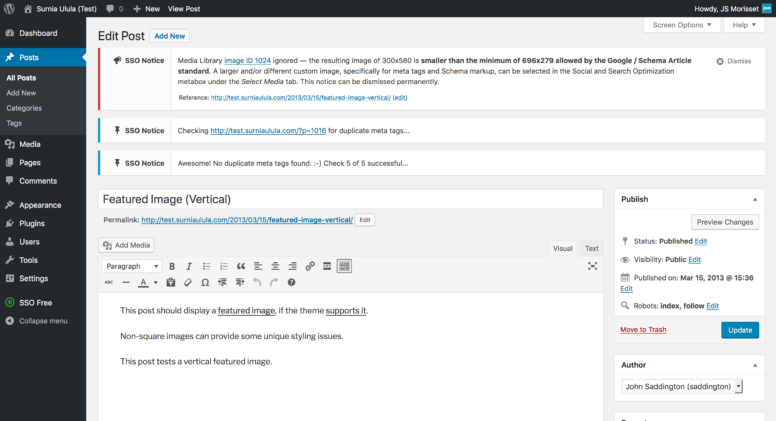 You can find out more about WPSSO Core from the plugin description page on WordPress.org. I like the way you people worked around. But don’t you think that would be anti-productive. I mean every time the count changes I need to go and check the notification. Whereas previously, notifications were there and I can see if that’s relevant or I can ignore for time being and focus on content. I would rather look forward towards Gutenberg team fixing this. That seems like a nice work-around until it gets fixed.